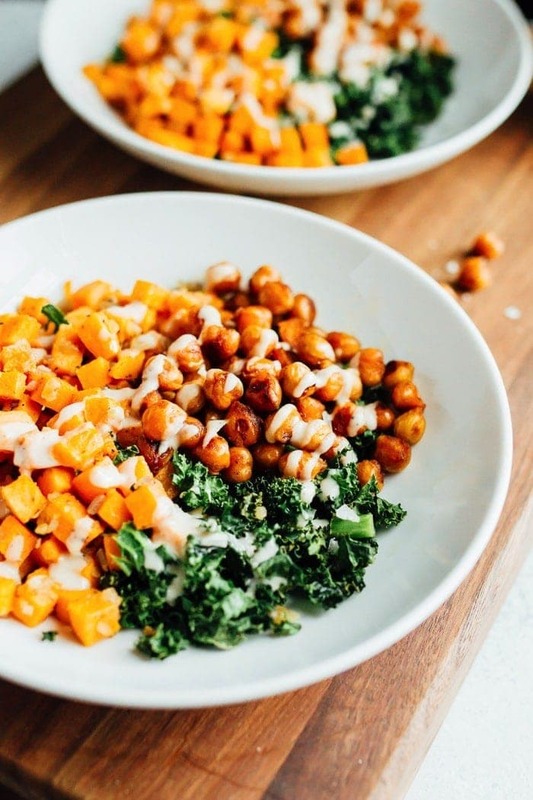 This vegan power bowl is loaded with roasted sweet potatoes and kale, spicy chickpeas and a creamy white bean and apple cider vinegar dressing. Recipe from Terra’s Kitchen. Vegan + Gluten-free. I know you hear me talk about Terra’s Kitchen all the time — how I really like the service, their eco-friendly containers, the FOOD and the fact that all of the meals take less than 30 minutes to whip up. But I realized that I’ve never actually shared any of the recipes with you. So today I’m sharing one of my recent favorites so you can get a taste (pun intended) of Terra’s Kitchen. Alright, so let’s talk about this vegan power bowl! 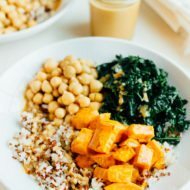 I was immediately drawn to it when placing my order because it reminded me of my kale and sweet potato brown rice bowls. For me anything with roasted sweet potatoes and kale = LOVE. The bowls are definitely similar ingredient-wise, but the flavor, cooking preparations and dressing make vegan power bowl super unique. I’ve found this to be true with most of the Terra’s Kitchen recipes we’ve tried. They use simple ingredients, but cook or combine them in a way that’s creative. With every meal I find myself learning something (a new flavor pairing or cooking idea), which is really fun for someone who spends a ton of time in the kitchen. With this bowl I learned that white beans make such a creamy and delicious sauce and that browning chickpeas in a skillet with brown sugar makes them crazy good. 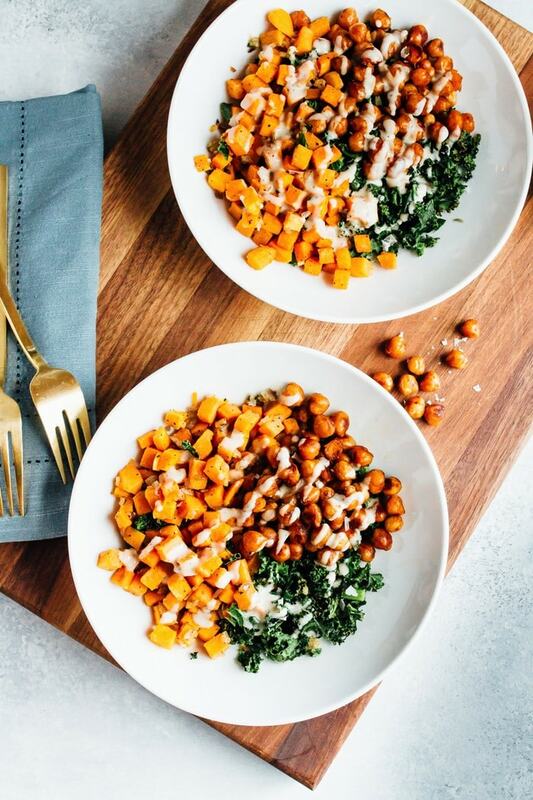 The kale and sweet potatoes are roasted on the same pan to save on time and clean up. Plus, the kale gets crispy, almost like kale chips. The dressing is made from white beans and apple cider vinegar so it’s super creamy with a subtle flavor. Once blended, you’d never guess that there are white beans in the sauce. The chickpeas are sautéed with a little brown sugar, chili powder, salt and pepper. 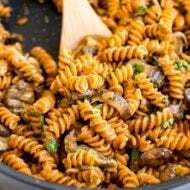 It gives them a marvelous semi-crunchy texture and a sweet and spicy flavor. You can turn the recipe into a meal prep bowl. See how I did it here. I hope you enjoy this vegan power bowl as much as we do. Just remember that when you order the meal with Terra’s Kitchen, all the ingredients are chopped and prepped, saving you a ton of time. That said, making this recipe from scratch will probably take a little longer than 30 minutes. I’ll also note that I’ve had some of the white bean dressing left over every time I’ve made this. I recommend saving the leftover dressing in the fridge and using it over a salad or another roasted vegetable dish. 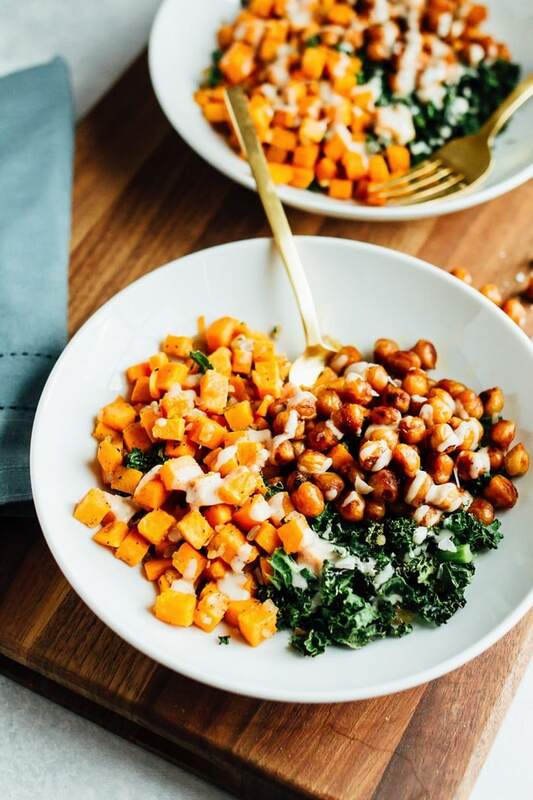 This vegan power bowl is loaded with roasted sweet potatoes and kale, spicy chickpeas and a creamy white bean and apple cider vinegar dressing. Preheat oven to 400° F. Line a baking sheet with foil or parchment. 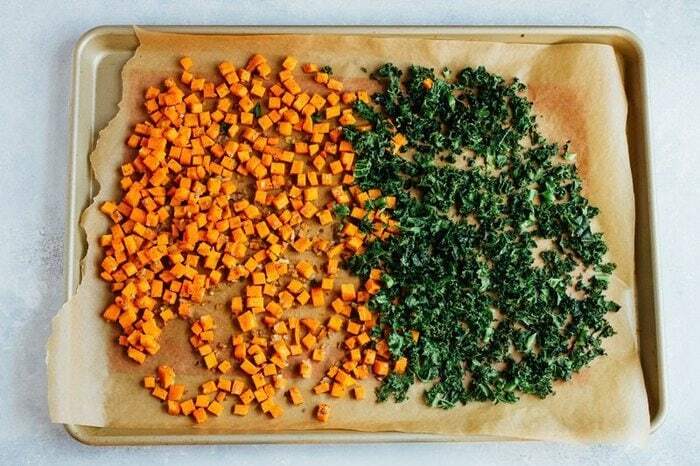 Prep Vegetables: Chop sweet potatoes and kale. Roast Vegetables: Spread sweet potatoes and onion onto the baking sheet and toss with 1 tablespoon of olive oil, ½ teaspoon salt, ¼ teaspoon pepper and ¼ teaspoon cumin. Spread out in an even layer and roast for 10 minutes. Use a spatula to flip over and push to one side of the tray. Add kale to the empty side of the baking sheet and drizzle with 2 teaspoons olive oil and a pinch of salt and pepper. Roast for 10 minutes more. While vegetables are roasting, heat a skillet (we like cast iron) to medium. Season Chickpeas: Add the chickpeas to a mixing bowl with the brown sugar, ½ teaspoon chili powder, ¼ teaspoon salt and a pinch of pepper. Use your hands to coat the chickpeas well. Cook Chickpeas: Add 1 tablespoon olive oil to the hot skillet. When oil starts to shimmer, add seasoned chickpeas and cook, stirring occasionally, until browned (about 8 minutes). Note: Don’t be alarmed if they look like they are burning…they aren’t! Make dressing: Into a blender, add beans, 2 tablespoons warm water, 1 Tablespoon apple cider vinegar, 1 Tablespoon olive oil, ½ teaspoon salt, ¼ teaspoon pepper and a pinch of ground cumin if desired. Blend until smooth and creamy. Add more water if necessary for a thinner dressing. To Serve: Divide roasted vegetables between two bowls, top with chickpeas and drizzle with dressing (or serve dressing on the side). Love this recipe and interested in giving Terra’s Kitchen a try? Use code BIRDFOOD for $30 off your first order! I love the bean dressing! That sounds fabulous! My family loves the TK Vegan Power Bowl! This sounds wonderful and agreed on that dressing – yum and thanks! Loving that sauce drizzle!! Looks so yummy! This is pretty much easy! Thanks for this recipe! Looks delicious and the white bean dressing sounds amazing! It’s so creamy. You have to try it! This looks so delicious! That dressing sounds ahhmazing! Hi Christina! I feel like I know you as well… maybe we met a conference way back in the day? Did you have a different blog name previously? And what is the new foodie comment pod? Love everything in this bowl!! The dressing! Nice! How much vinegar should be used? It just says “1 apple cider vinegar” Is that teaspoon or tablespoon? are the chickpeas drained/rinsed? This looks delicious! Yes! The chickpeas should be drained and rinsed. Sorry that was listed in the recipe ingredients/notes. Hi! 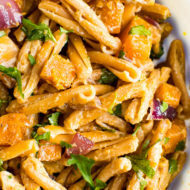 Looks great, trying this recipe right now! Where does the onion go? Can’t find it mentioned in the directions. Hi Colleen. It’s 1 Tablespoon of apple cider vinegar. Sorry for the confusion. Just made this the other night and it was DELICIOUS!! One of the best vegan meals I’ve had. Meat-eating husband loved it too 🙂 Next time I’ll have to make more batches to save for leftovers!